A while back I bought Madame a "stationary entertainer," not only so she would have something new to play with, but also so I could have a safe place to put her. After some debate I went with the one from Baby Einstein and now I'm really glad I did. 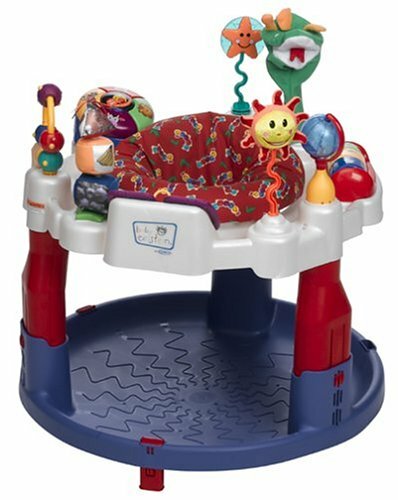 I'm sure I'm not the only parent who tries to limit the amount of babytoys that make annoying bleeping noises, but sometimes it's hard to avoid them - like in an exersaucer (sorry, "stationary entertainer"). On the Baby Einstein version there is only one thing on it that makes noise, this colorful disc with five pictures of animals on them. When you hit one of the animals, it says the name in English, then after a second hit it says it in Spanish, and then a third consecutive hit gets you a song. Normally it hasn't been a big deal, because by the time she accidentally got a song to play, she'd hit another animal, stopping the song. But last week my little genius has figured out the three consecutive hit rule, and she likes the music the best. Now she'll smack the duck (the picture in the center) over and over until the song plays - whereupon she'll immediately stop, smile, and rock back and forth. She loves it so much I can't turn the thing off, so I'm forced to listen to 30 seconds of Vivaldi's Spring over and over and over again. Which, all things considered, could be a lot worse.